This is a draft (July 29, 2005) of Part VIII of The Emotion Machine by Marvin Minsky. Send comments to minsky@media.mit.edu. вЂњAlthough machines can perform certain things as well as or perhaps better than any of us, they infallibly fall short in others, from which we may discover that they did not act from knowledge, but only from the arrangements of their parts.вЂќ вЂ”Descartes, in Discourse on Method, 1637. We are all accustomed to using machines that are stronger and faster than people are. But before the first computers appeared, no one could see how any machine could do more than a very few different things. This must be why Descartes insisted that no machine could be as resourceful as any person can be. Then Darwin observes that вЂњthe individuals of each species may graduate in intellect from absolute imbecility to high excellence,вЂќ and argues that even the highest forms of human thought could have developed from such variationsвЂ”because he sees no particular point at which that would meet an intractable obstacle. All modern computers use this trick, so today we can use the same machine to arrange our appointments, edit our texts, or help us send messages to our friends. Furthermore, once we store those descriptions inside the machine, then those programs can change themselvesвЂ”so that the machine can keep extending its own abilities. This showed that the limits which Descartes observed were not inherent in machines, but resulted from our old-fashioned ways to build or to program them. For each machine that we built in the past had only way to accomplish each particular taskвЂ”whereas each person, when stuck, has alternatives. В§1. We are born with many kinds of resources. В§2. We learn from our Imprimers and friends. В§3. We also learn what we ought not to do. В§4. We can reflect upon what we are thinking about. В§5. We can predict the effects of imagined actions. В§6. We use huge stores of commonsense knowledge. В§7. We can switch among different Ways to Think. This chapter discusses yet additional features that make human minds so versatile. В§8вЂ‘2. We can see things from many points of view. В§8вЂ‘3. We have special ways to rapidly switch among these. В§8вЂ‘5. We have efficient ways to recognize which knowledge is relevant. В§8вЂ‘6. We can keep extending the range of our ways to think. В§8вЂ‘7. We have many different ways to represent things. If you 'understand' something in only one way then you scarcely understand it at allвЂ”because when something goes wrong, you'll have no place to go. But if you represent something in several ways, then when one method fails, you can switch to another. That way, you can turn things around in your mind to see them from different points of view вЂ”until you find one that works for you! To show how this kind of diversity makes human thinking so versatile, weвЂ™ll start with examples of the multiple ways we use to estimate our distance from things. When youвЂ™re thirsty, you look for something to drinkвЂ”and if you notice a nearby cup, you can simply reach out to pick it upвЂ”but if that cup lies further away, then you will have to move over to it. But how do you know which things you can reach? A naГЇve person sees this as no problem at all because, вЂњYou just look at a thing and you see where it is.вЂќ But when Joan detected that oncoming car in В§4-2 or grasped that book in В§6-1, how did she know its distance from her? In primeval times we had to guess how near our predators were to us; today we only need to judge if we have enough time to cross the streetвЂ”but, still, our lives depend on this. Fortunately, we each have many different ways to estimate the distance to things. For example, you know that a typical cup is about as large as your hand. So if a cup fills as much of the scene as does your outstretched hand , then you can reach it from where you stand. Similarly, you can judge how far you are from a typical chair, because you know its approximate size. However, even when you donвЂ™t know an objectвЂ™s size, you still have ways to estimate its distance from you. For example, if you can assume that two things are of similar size, then the one that looks smaller is further away. Of course, that assumption may be wrong, if one of those objects is a small model or toy. And also, whenever two objects overlap, then the one in front must be closer to you, regardless of its apparent size. You can also get spatial information from how the parts of a surface are lighted or shaded, and from an objectвЂ™s perspective and context. Again, such clues are sometimes misleading; the images of the two blocks below are identical, but the context suggests that they have different sizes. If you assume that two objects lie on the same level surface, then the one that looks higher lies further away. Also, finer-grained textures look further away, and so do things that look hazier. You can also judge a distance to an object by difference in its images in your two eyesвЂ”either by the angles between those two images or by the small вЂ�stereoscopicвЂ™ disparities between those slightly different images. Also, if an object is moving, then the closer it is to you, the faster it will appear to move. You also can estimate its range by how you must change the focus of the lens of your eye. Finally, aside from all these perceptual schemes, one frequently knows where some object is, without using any vision at allвЂ”because, if youвЂ™ve seen a thing in the recent past, its location is still in your memory! Student: Why would we need so many different methods, when surely just two or three would suffice? In almost every waking minute, we make hundreds of judgments of distance, and yet we scarcely ever fall down the stairs, or accidentally walk into doors. Yet each of our separate ways to estimate distance has many different ways to fail. Focusing works only on nearby thingsвЂ”and many persons canвЂ™t focus at all. Binocular vision works over a longer range, but quite a few people are unable to compare the images in their two eyes. Some methods fail when the ground isnвЂ™t level, and texture and haze are not often available. Knowledge only applies to objects you know, and an object might have an unusual sizeвЂ”yet we scarcely ever make fatal mistakes because we can use so many different techniques. But if every method has virtues and faults, how do we know which ones to trust? The next few sections will discuss some ideas about how we manage to so quickly switch among so many different ways to think. The previous section emphasized how many different techniques we could use to accomplish the same objectives вЂ” mainly to know how far away some Object is. However, it would not help us very much to have so many methods available, unless we also had some way to switch among them almost effortlessly. This section will suggest a particular kind of machinery that, I suspect, our brains might use to do such switching almost instantly. In Chapter 6 we mentioned that when you read the sentence, вЂњCharles gave Joan the Book,вЂќ this can cause you to interpret вЂ�bookвЂ™ in several different realms of thought: as an object, possession, or storehouse of knowledge. However, having multiple representations wonвЂ™t help you much unless you use the context to rapidly switch to the appropriate meaning. Student: Why would you actually need to switch? Why canвЂ™t you maintain all those meanings at once? Whenever you walk into a room, you expect to see the opposite walls, but you know that you will no longer see the door through which you entered that room. Now walk to the West wall that is now to your left, and turn yourself to face to the right; then you will be facing toward the East. The South wall has now come into view, and the West wall now is in back of you. Yet although it now is out of sight, you have no doubt that it still exists. What keeps you from believing that the South wall just now began to exist, or that the West wall has actually vanished? This must be because you assumed all along that you are in a typical, box-like room. So, of course you knew just what to expect: all four sides of that room will still exist. Now consider that each time you move to another place, every object you that you have seen may now project a different shape on the retinas in the back of your eyesвЂ”and yet those objects do not seem have changed? For example, although the visual shape of that North wall has changed , you still see it as rectangular. What makes those meanings remain the same? Similarly, you now see an image of that chair in which it appears to have turned around вЂ”but you usually donвЂ™t even notice this, because your brain knows that it is you who has moved and not the chair. Also, you now can see the door that you entered throughвЂ”yet none of this surprises you! What if you next turn right to face the South? Then the North wall and chair will disappear, and the West wall will re-enter the sceneвЂ”just as anyone would expect. You are constantly making these kinds of predictions without any sense of how your brain keeps dealing with that flood of changing appearances: How do you know which things still exist? Which of them have actually altered their shapes? Which of them have actually moved? How do you know youвЂ™re still in the same room? Student: Perhaps those questions do not arise because weвЂ™re seeing those objects continuously. If they suddenly changed weвЂ™d notice this. In fact, our eyes are always darting around, so our vision is far from continuous. All this evidence seems to suggest that, even before you entered that room, you have already, somehow, assumed a good deal of what you were likely to see. вЂњThe secret is that sight is intertwined with memory. When face to face with someone you newly meet, you seem to react almost instantlyвЂ”but not as much to what you see as to what that sight вЂњremindsвЂќ you of. The moment you sense the presence of a person, a world of assumptions are aroused that are usually true about people in general. At the same time, certain superficial cues remind you of particular people you've already met. Unconsciously, then, you will assume that this stranger must also resemble them, not only in appearance but in other traits as well. No amount of self- discipline can keep those superficial similarities from provoking assumptions that may then affect your judgments and decisions.вЂќвЂ” Section В§24вЂ‘1 of SoM. If you use this kind of larger-scale structure, then as you roam about that room, you can store each new observation in some part of that more stable framework. For example, if you represent that chair as near the North wall, and the door as part of the South wall, then these objects will have a fixed вЂ�mental placeвЂ™вЂ”regardless of where you were when you noticed themвЂ”and those locations will stay the same even when those objects are out of sight. (Of course this could lead to accidents, if an object was moved without your knowing it! For vision, this shows how the space that surrounds us would seem to stay the same when we see it from different viewsвЂ”by linking features in different realms to similar roles in a larger-scale frame. For language, in В§6-1 we saw how this method could make вЂњCharles gave Joan the BookвЂќ seem to keep a single meaning when we interpret it in different realms. We introduced the term вЂњPanalogyвЂќ to describe such schemes for linking analogous features together. Student: How do we make new panalogies? How hard are they to build and maintain? Is the talent for making them innate or learned? Where do we place them in our brains? And what happens when one of them makes a mistake? We rarely make an entirely new idea, because, before you make records of anything new, you are likely already to have recalled some similar object or incidentвЂ”so then, we will usually copy and modify some structure that we already have. This is extremely useful because, otherwise, we would have no way to get access to that вЂ�new idea,вЂ™ or know which old skills to apply to it. Also, if that older concept already belongs to a panalogy, we can add the new idea as an additional leaf; then it will inherit the techniques by which that older is retrieved and applied. For example, you can think of a chair as a physical structure whose parts consist of a back, seat and legs. In that physical view, the chairвЂ™s legs support its seat, and both of these support the chairвЂ™s back. However, you can also think of a chair as a way to make people feel comfortable. Thus the chairвЂ™s seat is designed to support oneвЂ™s weight, the chairвЂ™s back serves to support oneвЂ™s back, and the chairвЂ™s legs support one up to a height designed to help a person to relax. Similarly, you could also regard that very same chair as an item of personal property, or as a work of art or of carpentryвЂ”and each of those various contexts or realms could lead you to represent chairs in different ways. Then, when your present way to think fails, your critics could tell you to switch to another. However, that switching might cost you a good deal of timeвЂ”if you were forced to start over. But, if you have grouped those several representations into a panalogy, by linking their similar features together, then youвЂ™ll be able more quickly to switch. Indeed, I suspect that much of what we know has been organized into panalogiesвЂ”so that we can see an automobile as a vehicle, or as a complex mechanical object, or as a valuable possession. We can see a city as a place for people to live, as a network of social services, or as an object that requires a lot of water, food, and energy. Chapter В§9 will argue that, whenever you think about your Self, you are reflecting about a panalogy of mental models of yourself. Student: But wouldnвЂ™t that make you mistake whatever you see for something else that it reminds you of? You would always be confusing things. Yes, and weвЂ™re constantly making those kinds of вЂ�mistakesвЂ™вЂ”but although this may seem paradoxical, that actually helps to keep us from being confused! For if you saw each object as totally new, then it would have no meaning to youвЂ”and you would have no ideas about what to do. However, if each new item gets linked to some older onesвЂ”as when a new chair reminds you of previous onesвЂ”then you will know some things you could do with it. If our memories mainly consist of panalogies, then most of our thinking will have to deal with ambiguous representations of things. However, this is a virtue and not a fault because much of our human resourcefulness comes from using analogies. В§8вЂ‘4. How does Human Learning work? Learning by changing or adding descriptions, statements and narrative stories. Learning by changing existing processes. Learning to prevent mistakes by making Suppressors and Censors. Learning to make better generalizations. Learning new links among our fragments of knowledge. Learning to make new kinds of analogies. Learning to make new models, virtual worlds, and other types of representations. How do we Learn so Rapidly? Jack saw a dog do a certain trick, so he tried to teach it to his own pet, but JackвЂ™s dog needed hundreds of lessons to learn it. Yet Jack learned that trick from seeing it only once. How did Jack so quickly learn so muchвЂ”although he has only only seen one instance of it? People sometimes need long sessions of practice, but we need to explain those occasions in which we learn so much from a single experience. However, here is a theory which suggests that Jack does indeed need many repetitionsвЂ”but he does them by using an вЂ�animal trainerвЂ™ inside his head, which he uses to train other resources inside his brain, in much the same ways that he would use to teach his pet! To do this, Jack could use a process like the Difference-Engine in В§6-3. It begins with a description D of that trick, which is now in his вЂ�short-term memory.вЂ™ Then JackвЂ™s вЂ�mental animal trainerвЂ™ can work to produce a copy C of this in some other, more permanent placeвЂ”by repeatedly altering C until there remains no significant difference between it and D. Of course, if D has many intricate parts, this cycle will need many repetitions. So this вЂ�animal-trainerвЂ™ theory suggests that when a person learns something new, they do need multiple repetitions. However, we are rarely aware of this, perhaps because that process goes on in parts of the brain that our reflective thinking cannot perceive. Student: Why canвЂ™t we simply remember D by making that short-term memory more permanentвЂ”in the same place where it now is stored? Why should we have to copy it to some other, different place? We are all familiar with the fact that our short-term memories are limited. For example, most persons can repeat a list of five or six items, but when there are ten or more items, then we reach for a writing pad. I suspect that this is because each of our fast-access вЂ�memory boxesвЂ™ is based on such a substantial amount of machinery that each brain includes only a few of themвЂ”and so, we cannot afford to use them up. This would answer the question our student asked: each time we made those connections more permanent we would lose a valuable short-term memory box! What could be the different between our short- and long-term memory systems? One answer to that appears to be our short-term memory systems use certain short-lived chemicals, so that those memories will quickly fade unless unless those chemicals keep being refreshed; in contrast, we have good evidence that long-term memories depend on the production of longer-lived proteins that make more permanent connections between the cells of the brain. It probably is no coincidence that modern computers evolved in a somewhat similar pattern: at every stage of development, fast-acting memory boxes were much more costly than slower ones. Consequently, computer designers invented ways to confine those expensive but fast-acting units into devices called вЂ�cachesвЂ™ that only store data that is likely soon to be needed again. Today, a modern computer has several such caches that work at various different speeds, and the faster each is, the smaller it is. It may be the same inside our brains. Here are a few other reasons why our memory systems may have evolved to require so much time and processing. Retrieval: When one makes a memory record, it would make no sense to store this away without providing some ways to retrieve it. This means that each record must also be made with links that will activate it when relevant (for example, by linking each new memory to some other existing panalogy). Credit Assignment: A record of how one solved a problem would be unlikely to have much future use if it applied only to that particular problem. WeвЂ™ll discuss this more in В§8-5. The вЂ�Real-EstateвЂ™ problem for Long-term memories. How could an вЂ�animal-trainerвЂ™ find room in the brain for the copy that it is trying to make? How could it find appropriate networks of brain cells to use, without disrupting connections and records that one would not want to erase? So, finding places for new memories may involve complex constraints and requirements, and this could be a reason why making permanent records takes so much time. Suppose that youвЂ™ve just had a вЂ�good ideaвЂ™ or solved a certain hard problem P. What, then, should you learn from this experience? One thing you could do is to construct a new rule: If the problem youвЂ™re facing is like problem P, Then try the solution that worked on P. That solution will probably help you with problems that closely resemble PвЂ”but it is unlikely to help with less similar problems. However, instead of just recording your solution to P, you could make a record of the Way To Think that used were using when you found that solution! Generally, one would expect this to help with a much wider range of other problems. But how you could make copy of anything like your entire state of mind? Clearly, that would never be practicalвЂ”but you might get a good approximation to it if you could, later, re-activate a substantial portion of the resources that were active when you solved problem P.
This way, for each kind of problem or job, your K-lines can fill your mind with ideas that might be relevantвЂ”by getting you into a mental state that resembles one that, in the past, helped with a similar job. Student: How could this help you do anything new, if it only re-uses a way to think that you already knew how to useвЂ”when you used it to solve that old problem? Student: I see how this new K-line could be used as a Selector for a new Way to Think. But how would you build a new Critic to recognize when to activate it? If we want to use that new K-line for problems like P, then a simple such Critic would recognize some combination of features of P.
However, such a Critic will rarely be useful if it requires all the features of P, because then it will not recognize situations that are slightly different that P. Also, each new K-line should include only resources that actually helped. Student: I see what you mean. Suppose that when you were fixing that bicycle, at some point you tried to use a tool that happened to make the problem worse. It wouldn't be good to paint that tool red because, then, later you would waste more time again. This suggests that when we make new Selectors and CriticsвЂ”or more generally, whenever we learnвЂ”we should try to make sure that what we learn will mainly consist of things that are likely to help. The following section discusses some processes that might help to ensure that what we learn will be relevant in future times. Should her learning include which shoes she wore, or the place in which those events occurred, or whether the weather was cloudy or clear? Which of the thoughts she was thinking then should be recorded in what she remembers? What if she smiled while using that fork, but happened to frown when using that spoon? What keeps her from learning irrelevant rules like, вЂњTo fill a cup, it helps to frownвЂќ? Some early ideas about how animals learn were based on schemes in which each reward for a success will cause a small вЂњreinforcementвЂќ of some connections in the animalвЂ™s brainвЂ”while every disappointment will cause a corresponding weakening. In simple cases, this can lead a brain to select the right features to recognize. [See В§В§В§Reinforcement] However, in more complex situations, such methods will not work so well to find which features are relevantвЂ”and then weвЂ™ll need to think more reflectively. Some other theories about how learning works assumed that this consisted of making and storing new If-Do reaction-rules. This could be one reason why JackвЂ™s dog in В§8вЂ‘4 needed so many repetitions: perhaps, each time that dog attempted that trick, it made a small change some If or some DoвЂ”but then, it only recorded that change in the case that it got a reward. That might work well in a simple case. However, in more complex situations, this kind of learning is likely to fail if the If of any new If-Do rule turns out to describe too few details (because then that rule will be applied too recklessly)вЂ”or if that If includes too many details (because then it may never apply again, because no two situation are ever exactly the same.) The same applies to the Do of that ruleвЂ”and so, each If and Do must be just abstract enough to make it apply to вЂ�similarвЂ™ situationsвЂ”but not to too many dissimilar ones. Otherwise, JackвЂ™s dog might need a new rule for every posture that it might be in. All this means that those old вЂ�reinforcementвЂ™ schemes might work well enough for some animals, but it seems unlikely they could be help much to explain how humans learn more complicated things. Choosing how to represent a situation will affect which future ones will seem similar. Unless you select only the parts of your thinking that helped, you may learn too many irrelevant things. It helps to do mental experiments to discover which features were relevant, by varying some of their elements. Each new fragment of knowledge or skill must be connected so that you can access it when it is relevant. The better those decisions are made, the more you will benefit from each experience. Indeed, the quality of those processes could be important aspects of the suitcase of traits that people call вЂњintelligence.вЂќ However, merely recording solutions to problems will help us only to solve somewhat similar problems, whereas if we can record how we found those solutions, that could further enable us to deal with much broader classes of situations. Thus, when you finally achieve a goal, you should assign some credit for this to the higher-level method you used to divide that goal into subgoals. Instead of just storing solutions to problems, you thus can refine the strategies you used to discover those solutions. Student: But then youвЂ™d also want to remember the strategies that led to those methodsвЂ”and youвЂ™ve started a process that never will end! There is no clear limit to how long one could dwell on what might have led to a certain success. Indeed, such realizations are sometimes delayed for minutes, hours or even days; this suggests that some of our credit-assignments involve extensive searches that go on in other parts of our minds. We usually make our Credit Assignments without much reflection, but sometimes one may say to oneself, after completing some difficult job, вЂњIt was stupid of me to waste all that time, when I knew how to do it all along.вЂќ To keep from making that error again, we need to modify our way to retrieve that particular fragment of knowledgeвЂ”or perhaps make some change in some Critic that failed to remind us of it. Similarly, one sometimes may ask, вЂњHow did I manage to solve that hard problem?вЂќ or вЂњWhat were the critical steps in that process? Of course, we cannot always find answer to those, because it may be harder to understand how one found the solution than it was to solve the problem. Nevertheless, such questions suggest that our credit-assignments sometimes depend on high-level reflections. In any case, if we want to understand how people learn, we will need more research on such questions as what kinds of credit assignments infants can make, how children develop better techniques, how long such processes persist, and the extent to which we can learn to control them. In chapter В§9 we will also discuss how our feelings of pleasure might relate to how we make our credit-assignments. Transfer of Learning to other realms. Every teacher knows the frustration that comes when a child learns something to pass a test, yet never applies that skill to anything else. What makes certain children excel at "transferringвЂќ the things they learn to other, different realmsвЂ”whereas other children seem to need to relearn the same ideas in each domain? It would be easy just to say that some children are вЂ�more intelligentвЂ™вЂ”but that would not help us to explain how they use their experiences to make more helpful generalizations. This could partly be because they are better at making and using panalogies. But also, as we have just seen, the better our ways to describe each event, the more we can learn from each incident. Indeed, those вЂ�smarterвЂ™ children may have come to learn more efficiently because they have learned to reflect (perhaps unconsciously) about how their own learning processes workвЂ”and then found ways to improve those processes. For example, such reflections may lead to better ideas about which aspects of things they ought to learn. This section has argued that, to gain more from each experience, it would not be wise for us to remember many details of each situationвЂ”but only those aspects that were relevant to our goals. Furthermore, what we learn can be yet more profound, if we assign the credit for our success, not only to the final act that led to our failure or success вЂ”or even to the strategy that led to itвЂ”but to whatever earlier choices we made that selected our winning strategy. Perhaps our unique abilities to make such high-level credit-assignments accounts for many of the ways in which we surpass our animal relatives. We admire our Einsteins, Shakespeares, and BeethovensвЂ”and many people insist that their accomplishments are inspired by "gifts" that no one could ever explain. If so, then machines could never do such things because (at least, in the popular view) no machine could hold any mysteries. However, when one has the fortune to meet one of those persons that we portray as вЂњgreat,вЂќ one finds no single, unusual trait that seems to account for their excellence. Instead (at least it seems to me) what we find are unusual combinations of otherwise common ingredients. Everyone has some share of each such trait, but few develop so many of them to such unusually great extents. Citizen: Each of those traits might help to explain how regular people solve everyday problems. But surely there be something unique about such great thinkers as Feynman, Freud, and Asimov. Suppose that there were, say, 20 traits that might help to make someone exceptional, and assume that each person has an even chance to excel at each particular one. Then weвЂ™d expect only one in each million persons to excel at all of those 20 traits. But statistics alone never tell us the reasons! For even if that argument were correct, it would shed no light at all upon either the nature of those variations or why just those particular people develop so many of those traits. For example, perhaps to acquire so many such qualities, a person must first develop some unusually good ways to learn. In any case, there is plenty of solid evidence that, to a significant extent, many of our mental traits are genetically inherited. However, I suspect that yet more important are the effects of fortunate mental accidents. For example, most children discover various ways to arrange their toy blocks into columns and rowsвЂ”and if observers praise what theyвЂ™ve done, those children may go on to refine those new skills. Then, some of those children may also go on to play at discovering new ways to think. However, no outside observer can see those mental events, so those children will have to learn by praising successes inside their own minds. This means that when such a child does remarkable things, outsiders may see no clear cause for thisвЂ”and will tend to describe that childвЂ™s new skills with terms like talents, endowments, traits, or gifts. The psychologist Harold McCurdy suggested another вЂ�fortunate accidentвЂ™ that could bring out exceptional traits in a childвЂ”namely to have been born with exceptional parents. It would also appear that outstanding thinkers must have developed some effective techniques that help them to organize and apply what they learn. If so, then perhaps those skills of вЂ�mental managementвЂ™ should get some credit for what we perceive as the products of genius. Perhaps, once we understand such things, weвЂ™ll be less concerned with teaching particular skills and more teaching children how to develop those more generally powerful mental techniques. Citizen: But can we really hope to understand such things? It still seems to me that there is something magical about the ways in which some people imagine completely new ideas and creations. Many phenomena seem magical until we find out what causes them. In this case, we still know so little about how our everyday thinking works, that it would premature to assume that there is a real difference between "conventional" and "creative" thought. Then why would we cling to the popular myth that our heroes must have inexplicable вЂ�giftsвЂ™? Perhaps weвЂ™re attracted to that idea because, if those achievers were born with all their wonderful tricks, we would share no blame for our deficienciesвЂ”nor would those artist and thinkers deserve any credit for their accomplishments. The Investment Principle: If you know of two ways to achieve some goal, youвЂ™ll usually start with the one you know bestвЂ”and then that method may gain so much additional strength that youвЂ™ll tend to use the second one lessвЂ”even if others have told you that that the second is the better one. Thus, sometimes the problem is simply that for one to develop a new way to think, one may have to endure the discomfort of many awkward or painful performances. So, one вЂ�secret of creativityвЂ™ may be to develop the knack of enjoying that sort of unpleasantness! WeвЂ™ll explore this more in chapter В§9, when we talk about Adventurousness. Everyone can imagine things; we hear words and phrases inside our minds. We envision conditions that donвЂ™t yet existвЂ”and then exploit those images to predict the effects of possible actions. Much of our human resourcefulness must come from our abilities to manipulate mental models and representations of objects, events, and other conceptions. But what do we mean by a model or a representation? As I suggested in В§4-5, I am using those words to talk about any structure inside oneвЂ™s brain that one can use to answer some questions about some subject. Of course, those answers will only be useful when your вЂ�modelвЂ™ or вЂ�representationвЂ™ behaves enough like the modelвЂ™s subject doesвЂ”for the purposes that concern you now. A verbal description of that incident. A visual simulus of the scene. Some models of the persons involved. Simulations of how those persons felt. Predictions about what might happen next. Why would your brain represent the same event in so many different ways? Perhaps each realm of thought that was engaged left an additional record or trace in some different network inside your brain. This will enable you, later, to use multiple ways to think about that same incidentвЂ”for example, by using verbal reasoning, or by manipulating mental diagrams, or by envisioning the actors вЂ�gestures and facial expressions. Today, we still know little about how our brains make those memory traces or how they later retrieve and вЂ�replayвЂ™ them. We do know a lot about how separate brain-cells behave, but we do not yet have good explanations of about how our larger-scale columns and networks of cells manage to represent past events. Nor do our self-reflections help; although as we saw in В§8-4, this must involves complex processes, nevertheless it seems to us that we simply вЂ�rememberвЂ™ what happens to us. In any case, one cannot record an event itself, but one can only make some descriptions of how that event affected oneвЂ™s mental state. Some earlier sections of this book discussed some structures that could used to represent such information. The following section will review some of these, and then speculate about how such structures might be arranged in our brains. Multiple Ways to Represent Knowledge. This section reviews some structures that researchers have used to represent knowledge inside computers. I will have to leave out most smaller details (many of which are discussed in chapter 8, 19, and 24 of The Society of Mind). Some non-technical readers might do well to skip this section. 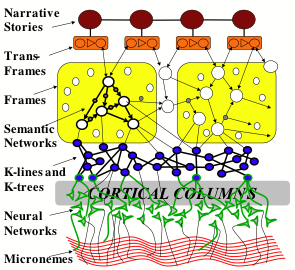 Semantic Networks: However, when we need to describe more details, such as the relations between an objectвЂ™s parts, it may be better to use the kinds of вЂ�semantic networksвЂ™ we saw in В§4-6 to represent a personвЂ™s self-model, and in В§5-8 to represent the structure of a physical book. Trans-Frames: To represent the effects of an action, it is convenient to use pair of semantic networks to represent what was changed. This is what we did in В§5-8 to imagine replacing the top of an arch. This way, one only needs to change the name of a single relationshipвЂ”instead of altering thousands of points to change a visual picture-like image. Such a sequences can describe a script that includes any further details that one might need. Each of these types of representation can answer certain types of questionsвЂ”but what could enable computers to produce answers so quickly as human brains do? When someone says вЂ�apple,вЂ™ you seem to almost instantly know that a typical apple grows on a tree, is round and red, is about the size of a human hand, and has a certain texture, flavor and tasteвЂ”yet almost no time seems to elapse between hearing that word and then becoming aware of such things. To explain how that information could so quickly appear, I conjecture that much of such knowledge is wrapped into structures called Frames. The simplest type of Frame consists of nothing more than a labeled list of some properties of particular object, and you can think of this kind of list as like a printed form that has вЂ�blanksвЂ™ or вЂ�slotsвЂ™вЂ”each of which can be filled-in with a link to some fragment of knowledge. Then, when you know which slot to inspect, you can quickly retrieve that fragment of knowledge, without need much time to search for it. Default Assumptions: A valuable feature of a typical frame is that every slot comes already filled in with some вЂ�defaultвЂ™ or typical value for it. Then you can use such a value to make a good guess whenever you donвЂ™t have a more definite answer. For example, you might assume вЂ�by defaultвЂ™ that an apple is redвЂ”but if your particular apple is green, then you will replace вЂ�redвЂ™ by вЂ�greenвЂ™ in its color slot. In other words, a typical frame describes a stereotype whose вЂ�default assumptionsвЂ™ are usually rightвЂ”but which we can easily change or replace when we encounter exceptions to them. This would seem to be an important aspect of how we do commonsense reasoning. This frame includes two semantic networks that describe the situations Before and After that trip was taken. However, it also contains other slots that describe when, how and why Joan took that trip. Then the default assumptions included in those slots can supply additional knowledge for answering such questions as these. Where did that action occur and when? Who or what caused it to happen? Was it intentional or not? What purposes was it intended to serve? What devices or tools were used? What were its other side effects? Which resources did it engage? What was expected to happen next? This suggests an explanation of how we quickly use our commonsense knowledgeвЂ”without any sense that weвЂ™re doing it: it is an example of the вЂњImmanence IllusionвЂ™ that we described in В§4-3.1. As soon as you activate such a frame, then many questions that you might otherwise ask will already be answered before you can ask themвЂ”because they are among the default values of that frameвЂ™s slots. For example, if you heard that Charles was holding a book, you would not stop to ask why he was holding it; you would simply assume that he has the most usual goal for which any person holds anythingвЂ”namely, to keep it from falling to the floor. Student: This book suggests some ideas about how high-level knowledge-based systems could come to achieve things like human commonsense reasoning. But why were no such systems built in the past? Work on such systems almost came to a stop in the 1980вЂ™s because most researchers recognized that that this would need ways to acquire and to organize millions of fragments of commonsense knowledge. That prospect seemed so daunting that most researchers decided to search for simpler alternatives. This led to many attempts to design some single process that would somehow evolve whatever it neededвЂ”along with learning all the knowledge it would need by interacting with the external world. Some of these вЂњbaby machinesвЂќ did learn to do some useful things (such as to recognize various kinds of patterns) but as we noted in Chapter В§6, none of them went on to develop more higher-level reflective ways to think. This kind of representation can help you answer many questions about an apple, such as where you can find one and what you can use it forвЂ”because a semantic network can express all sorts of different relationships, whereas numerical representations ultimately limit a systemвЂ™s mental growth, because they provides no parts that the rest of a mind can use to produce more elaborate explanations. Micronemes for Contextual Knowledge. We always face ambiguities. The significance the things that you see depends on the rest of your mental context. This also applies to events in your mind, because what they mean depends on which mental resources are active then. In other words, no symbol or object has meaning by itself, because your interpretation of it will depend on the mental context youвЂ™re in. For example, when you hear or read the word block, you might possible think that it means an obstacle to progress, a certain kind of rectangular object, a wooden board to chop things on, or a stand on which things in an auction are shown. Then which interpretation will you select? Residence, office, theater, or car. On the input side, we shall assume that many of your mental resourcesвЂ”such as K-lines, Frame-slots, or If-Do-Then rulesвЂ” can alter the states of some micronemes. Then the present state of your micronemes could represent much of your current mental contextвЂ”and the states of those fibers are changed, your far-reaching bundle of micronemes will broadcast that information to many other mental resourcesвЂ”so that this will change some of your attitudes, outlooks, and states of mind. In other words, this system could switch you into other, different ways to think. I think that this concept of micronemes could help to replace many old and vague ideas about вЂ�association of ideas.вЂ™ In В§В§Brain-Waves, we suggest more details about how such a system could play central roles in how our mental processes are organized. This diagram suggests how a brain might organize its ways to represent knowledge. However, we should not expect to find that actual brains are arranged in such an orderly way. Instead, we should not be surprised if anatomists find that different regions of the brain evolved somewhat different such organizations to support mental functions in different realmsвЂ”such as for maintaining our bodily functions, manipulating physical objects, developing social relationships, and for reflective and linguistic processes. From where do we obtain our ways to represent knowledge, and why do we find it so easy to arrange our knowledge into panalogies? Are these abilities installed genetically into our infant ofmemory systems, or do we learn them individually from our experiences? These questions suggest a more basic one: how do we manage to learn at all? As Immanuel Kant pointed out long ago, learning to learn is one of the things that we cannot learn from experience! So, although sensations give us occasions to learn, this cannot be what makes us able to learn, because we first must have the вЂ�additional knowledgeвЂ™ that our brains would need, as Kant has said, to вЂњproduce representationsвЂќ and then вЂњto connectвЂќ them. Such additional knowledge would also include inborn ways to recognize correlations and other relationships among sensations. I suspect that, in the case of physical objects, our brains are already innately endowed with machinery to help us вЂњto compare, to connect, or to separateвЂќ objects so that we can represent them as existing in space. All this leads me to suspect that we must be born with primitive forms of structures like K-lines, Frames, and Semantic NetworksвЂ”so that that no infant needs to wholly invent the kinds of representations that we depicted above. However, I doubt that weвЂ™re born with those stuctures complete, so it still requires some effort and time for us to refine those primitive representations into their more adult forms. I hope that soon there will be some research on how that development process works..
Could any person ever invent an totally new kind of representation? Such an event must be quite rare because no type of representation would be useful without some effective skills for working with itвЂ” and a new set of such skills would take time to grow. Also, no fragment of knowledge could be of much use unless it is represented in a familiar way. For reasons like these, it makes sense to conjecture that most of our adult representations come either from refining our primitive ones, or by acquiring them from our culture. However, once a person has learned to use several different representations, then that person might be more able to invent new ones. Indeed, we see such skills in the work of those exceptional writers, artists, inventors, and scientist who repeatedly discover new and useful ways to represent things. How should a brain proceed to select which representation to use? As we have emphasized several times, each particular kind of description has virtues and deficiencies. Therefore it makes more sense to ask, "Which methods might work well for the problem IвЂ™m facingвЂ”and which representations are likely to work well with those methods?" Most computer programs still, today, can do only one particular kind of task, whereas our brains accumulate multiple ways to deal with each type of problem we face. However, once we better understand how to organize such resources, , along with knowledge to help us decide which technique to use in each situation. To do this we need to develop a wide range of ways to represent those all those capabilitiesвЂ”so that, whenever the method weвЂ™re using fails, we can switch to another alternative. Turing described these вЂњuniversalвЂќ machines before any modern computers were built. For more details about how these work, see http://mathworld.wolfram.com/UniversalTuringMachine.html. There is a detailed theory of how this works in В§24.6 Direction-Nemes of The Society of Mind. It was recently discovered only recently that people often do not perceive some very large changes in a scene. See [give reference] for astonishing demonstrations of this. See Chapter 3 of William Calvin, How Brains Think, Basic Books, 1966. For more details about the relations among different nearby things, see chapter 24 of SoM, which also tries to explain why the shapes of things donвЂ™t seem to change when we look at them from different directionsвЂ”as well as why things donвЂ™t seem to change their locations when you move your eyes. I wonder if Hume had some such idea when he said: вЂњAll belief of matter of fact or real existence is derived merely from some object, present to the memory or senses, and a customary conjunction between that and some other object. вЂ¦ [This results from] a species of natural instincts, which no reasoning or process of the thought and understanding is able either to produce or to prevent.вЂќвЂ”David Hume, An Enquiry Concerning Human Understanding, 1748. David Hume, ibid. Part II. Note that this is a difference-engine вЂ�in reverse,вЂ™ because it changes the internal description, instead of changing the actual situation. See вЂњVerbal expressionвЂќ in SoM В§22.10). Robert Stickgold et al., Cognitive Neuroscience (Vol. 12, No. 2) in March 2000, also Nature Neuroscience (Vol. 3, No. 12) in December 2000. Another answer might be that some information is stored вЂ�dynamicallyвЂ™вЂ”for example by being repeatedly echoed between two or more different clusters of brain cells. I described a similar system for verbal communication in В§22.10 of SoM. The K-line idea was first developed in [Ref: Plain Talk] and [Ref: K-lines]. Chapter 8 of SoM describes more ideas about what might happen when K-lines conflict. Perhaps she used that facial expression to help her maintain her concentration. If this became part of her subsequent skill, it could later be hard to eliminate. A. Newell, "The chess machine," in Proc. Western Joint Computer Conf. March 1955. People often describe such moments as the times at which they make their decisionsвЂ”and then regard these as вЂ�acts of free will.вЂќ However, one might instead regard those moments as merely the times at which oneвЂ™s вЂ�decidingвЂ™ comes to a stop. Presumably, these capacities also may vary among different parts of the same mind. Some of this section is adapted from В§7.10 of SoM. Harold G. McCurdy, The Childhood Pattern of Genius. Horizon Magazine, May 1960, pp. 32-38. McCurdy concluded that mass education in public schools has "the effect of reducing all three of the above factors to minimum values." Where do we get those default assumptions? Answer: we usually make a new frame by making changes in some older one, and values that were not changed at that time will be inherited from those older ones. I should add that a frame can include some additional slots that activate other processes or sets of resources. This way, a frame could transiently activate ways to thinkвЂ”so that one almost instantly knows how to deal with some familiar object or situation. I should add that numerical representations have many useful applications. However, even when those numbers have some practical use, one can only alter them by increasing or decreasing them, but cannot add other nuances. It is much the same вЂ�logicalвЂ™ systems; each вЂ�propositionвЂ™ must be true or false, so the system still uses something like numbers, except that their values can only be 0 or 1. Also, see see SOM, section 5.3. В§В§20.1 of SoM argues that even our thoughts can be ambiguous. Also, several such functions could be superimposed in the very same spatial regions, by using by genetically distinct lines of cells that interact mainly among themselves. Later Kant claims that our minds must start with some rules like вЂњEvery change must have a cause.вЂќ Today, one might interpret this as suggesting that weвЂ™re born with frames that are equipped with slots that we tend to link to the causes of changes. In the simplest case, of course, that need could be satisfied by a link to whatever preceded the change that occurred; in later years we could learn to refine those links. There is more discussion of this in web.media.mit.edu/~minsky/papers/SymbolicVs.Connectionist.html.